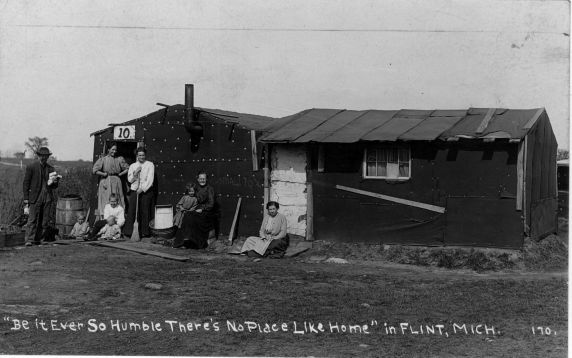 The families of auto workers pose for a photograph outside of their company owned home (#10) in Flint, Michigan. The words "Small Pox" are written on the tar paper that covers the exterior of the building. Caption on the back of the photograph reads: "Master and Slave - Here is the home of one of the slaves of 'The Buick' subject to removal from the land of 'The Buick' on five days notice."